Re: Full beard & horseshoe mustache? Full beard & horseshoe mustache? I like the look of the horseshoe mustache that hulk hogan wears but I have a 2 month full beard and only inches long on the mustache so I can't do anything but dream and train my mustache to grow away from my mouth. I am aiming for a foot long beard. Is there anyway I can combine the horseshoe mustache with a full beard? I've only seen straight or handlebar mustaches with a full beard. The infamous Myk O'Connor, of Whisker Wars fame, immediately came to mind (see attached). Last I heard, though, he cut his hair short, got rid of the long beard and long mustache, and now has a short, conservative-style beard and 'stache. 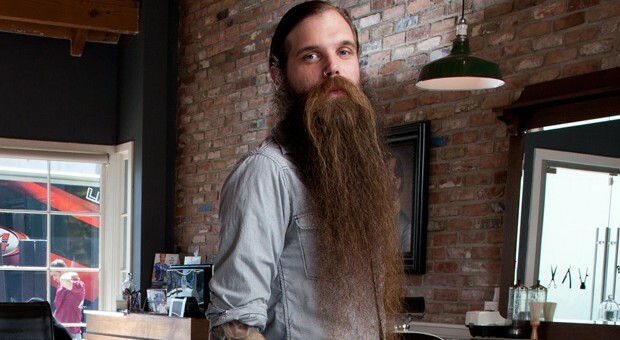 But in this older picture of him, at least, I think this is a good representation of what a horseshoe mustache, combined with a long beard, looks like. Now that's not at all to say that your beard won't hit the foot-long mark (or maybe even longer). May you have great luck on your goal. I would love to see you hit that mark. Cool picture & really impressive! Even if my genetics only give me half a foot till I get to terminal length then that's enough. My hair is at a foot, though, so I'm hoping my beard can do that. Genetics aren't the only things that hair growth depends on-you can control diet, exercise, and supplements. For diet, I've read that flax seeds, Greek yogurt, and oatmeal should be in there and not necessarily all at once. I eat oatmeal for breakfast with ground up flax seeds and then Greek yogurt at lunch with ground up flax seeds again. For exercise I try to get to the GYM 3 times a week and do cardio exercise on a treadmill (just walking) and leg machine exercises. You're trying to increase testosterone in your body and I read that working glutes does that-especially leg press or leg squats. Does it work? The guy in that video is a lot younger than me and thinks it has filled in patchy areas. My patchy areas have filled in but I'm twice his age and have not had much of a patchy area problem since my 20s. It may work. I know my beard growth rate is 2/3 inch a month which is higher than the average growth rate of 1/2 inch a month. I don't know what it was before the diet and supplement changes and I've always exercised since I was 15. Edited 1 time(s). Last edit at 09/15/2018 08:41AM by LinuxHippy. Well, my friend, don't get your hopes up by adopting any or all of those techniques. At best, it'll make whatever hair you have HEALTHIER, but it's most likely not going to make the DNA change its coding. If the DNA of your hair follicles is programed to grow to 13-inches and stop, then that's where it's going to stop. It's the same thing with baldness. If your hair follicles are programed to die off on certain parts of your head at a certain age, then that's what's going to take place. At that point, all diet and exercise and supplements will be doing will be making what hair you have healthier (stuff like shininess and strength and oiliness, etc.). Now I am but one example, so as you know, that does not even remotely make a sample size, but for years now, I have been taking the "hair, nail, and skin" vitamin supplement (twice a day, as per instructions) that I get at Whole Foods. For over 31 years now, I have been running six days per week. For well over 15 years now, I have been doing upper-body exercises, also six days per week. In the past three years, I have never eaten healthier. I get a decent amount of daily sleep, with some naps on the weekend. Yet my head hair is thinning, and my beard has stopped growing. Why? Because this is what my DNA has been coded to do. But if you're going to follow the course you've outlined above, then I am rooting for you and would love to be proven wrong. Seriously, I would love for you to be able to grow a big, massive, long beard. Maybe u didn't mean that u exercise upper body but whole body 6x a week. I've heard upper body M,W,F and lowers Tu,Thu,Sa because muscles need 48 hours rest between workouts. I almost have 2" now and like the look. A foot maybe too much. More like upper chest length. Daily living may just be too much because just washing my face or eating maybe a pain. My dad says he has a long beard but I haven't seen him in many years. Last time I saw him he had it down to upper chest I'm pretty sure because my mom called him Santa (they're divorced). Edited 2 time(s). Last edit at 09/15/2018 06:53PM by LinuxHippy.